Play Categories, a fun creative-juicy word game (and you could win a prize)! 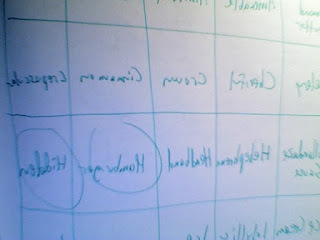 "Categories” or “The Grid Game” is something my family played on car trips or at home. As an adult, I have found it to be a lot of laughs at parties or writing jams. It’s also a good way to stir up creative energy. At the last writing jam at my place, Jud, Maria, Janice, Rachel, Lauren, Jason, Ajua and I played. Sharing our results inspired belly laughs as well as a-ha moments. Then we used the answers we came up with as a wordlist for free writing. 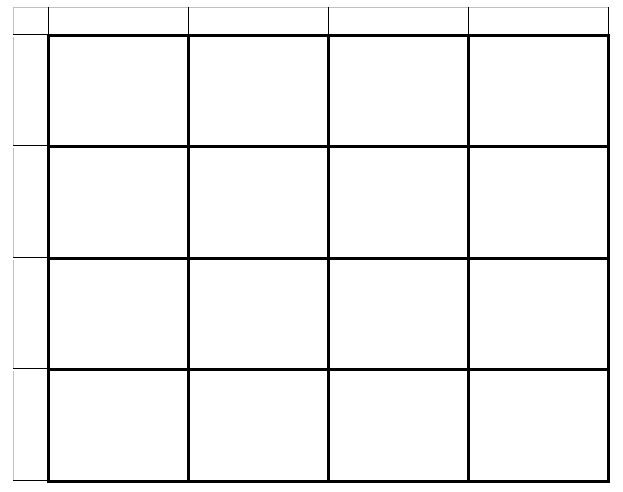 Create a 4x4 grid on a piece of paper. You could do this by folding a paper into 16ths, or just draw lines. Here’s mine. You’ll notice I left a little space above and to the left, which is not a bad idea. 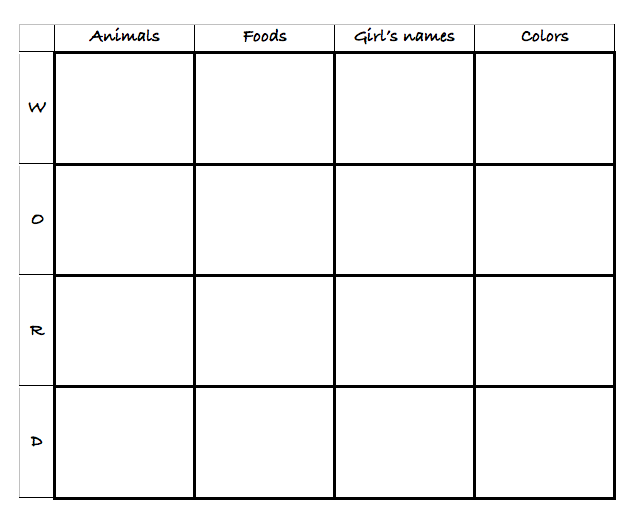 Above each column, we'll write our categories. 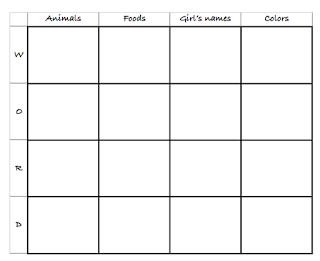 When I was a kid, we used categories like animals, foods, girl’s names, and colors. As an adult, I have found it more fun to use farther-fetched categories, as you will see. 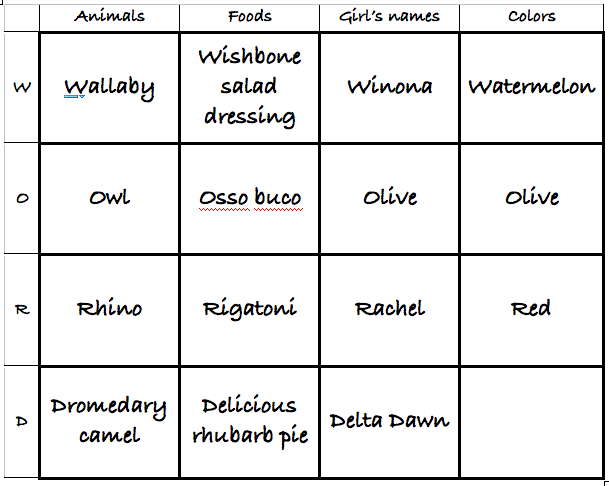 When our categories are in place, we pick a four-letter word in which no letters repeat, such as “WORD,” and we put these letters down the left side of the grid so each row is labeled by one letter. 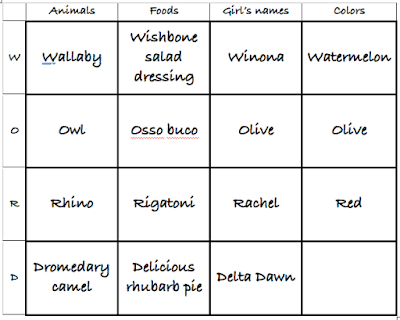 Now we fill in the grid with words in the categories that start with the letters, that is, animals that start with the letters W, O, R, and D; foods that start with those letters, and so on. You can work in any order you wish. Usually, there is a time limit, five or ten minutes, but since we’re playing online, take the time you need. I suggest working out of your head with no external resources, but you may do as you wish without fear of reprisal. Spelling isn’t so important (Osso Bucco has two Cs). There's nothing wrong with putting the same word in more than one category if it fits both. Rules are malleable. “Wishbone salad dressing” is absolutely a food, but a bit of askew to the category. I would still count it. Answers can go out of bounds. Where “out of bounds” begins is not definitive, but “Delicious rhubarb pie” would generally be regarded as a poor answer because "Delicious" is not a food and "Rhubarb pie" does not start with D. I would declare this answer unpointworthy. I left “Color-D” blank because I couldn’t think of one. With all the time you need, you don’t need to leave any space blank, but you shouldn’t feel bad about doing so if you can’t think of anything. Blanks are okay. When I was a kid, we scored one point for each cell we filled with a passable answer, and we earned a bonus point if nobody else had the same answer. With categories like “Colors,” this encouraged us to think outside the grid and reach father than “Red.” It also taught us to take risk. We might venture to put in “Raisin-color” only to have family consensus declare the answer unworthy of a point. But the discussion about how to score the word was always lively. My family was plenty good at being creative, though, so when we got older, we reversed the scoring criteria. 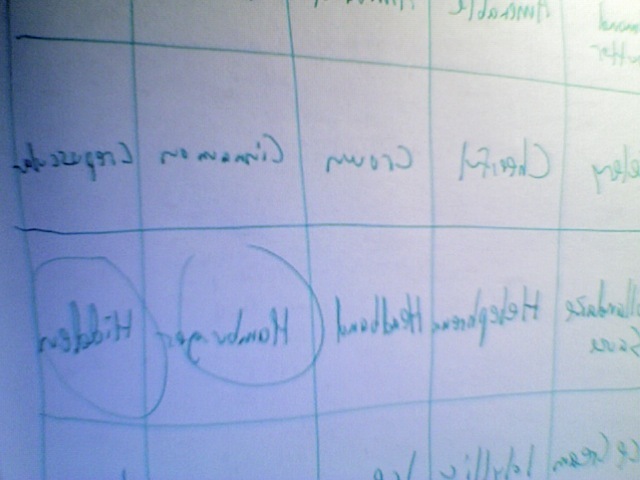 We still got a point for each cell filled, but the bonus point was earned when our answers matched someone else’s. This encouraged us to try to find the obvious answer, but by then our categories had gotten more sophisticated, so matching was rare. The point, though, is that points are mainly beside the point. If you want them, enjoy them. Take one point for each cell filled. If you see someone match your answer, take a single bonus point (you get one bonus point no matter how many people match). When you post your answers, I will arbitrate where you get extra points for answers that are especially good (not to put too fine point on it). Write in the categories and words below. 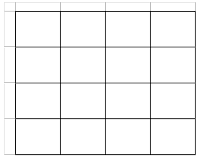 Fill in the grid and post your answers by May 21. I will award points and declare a winner, which will be largely arbitrary, so neither the winner nor non-winners will have cause to take it personally. The winner will get a prize! You may then use some or all your words in a poem and post that here, too. 4-Syllable Words - Bonus point if no two of these END with the same letter. A competitive first entry by Patricia! Genuine LOL at Kickedin Ball earns 2 bonus points. Kell's jar of fireflies earns another for the richness of imagery. Ants in Pants Polka gets an extra point just because I like polka and appreciate the surprise-factor of this entry. 1 bonus point for ending the 4-syallable words with different letters. Total FWP points: 21 with a woot! Revised: 22 with a hoot. +1 for coffee in lapdance. Nice! 16 for the complete set. +1 for four very different ways of synonymizing "light" +3 for the double-letters in the made-up band category, and +1 4-syllable bonus. FWP points: 21 cha cha cha. "This was fun" I second that! Lionmother (and happy Lion Mothers Day) earns 16 points for completion. Both Apache and Krumping made me say "ahhh" so I'll give an extra point and a half between the two. +1 point for the 4-syllable word bonus. Also like "Artists and Acrobats." +1. I think "Bad Boys" actually is a band, but I will pretend I don't suspect that and let it slide :) Nice going with a 19 1/2 point grid and a ROAR. Big fun! :) Thank you. Bikini Bump, Bling, Big Daddy Beer, Boisterously. Arabesque, Aha!, Albony teeny tights, Alterations. Klod-hopping,Krio-mite explosion, Knittens (kittens made of yarn!) and Kiss-a-holic. I'm compelled to respect the finessed geekiness of "Congress of Vienna" with a +1. +1 for Collapsible Giraffe. I like the sound of that band. + 1/2 for ampersandwich, which could have appeared in the made up bands category as well. And could I eat that with a caret, please? I see I coincided with TK on three of the four "lights". I guess we think alike. Is that OK? Should I come up with others instead? If you prefer: Bright, Albedo, Candle, and Kate Moss. Re: your FB comment, yes we used to play 5x5 grids. I thought 4x4 would be easier for online play, at least to start. I hope to do more of these and throw some wild cards out there in the future. You know all about wild cards! You score 16 for the grid. +1 for the 4-syllable bonus challenge. +1 for Band Name for Dummies, and +2 total for 4 double-word entries for a grand total of 20 FWP points and a blackjack! I'll look at the other entries now. Will I write something... not yet sure! Hugs. Glad you felt like another ground of the grid game. If you'd like an FWP score, here it is: 16 for completion, +2 for listing 4 dances I'd never heard of but at least 3 of which I have danced myself. +1 for The Kibitzers, my new favorite post-punk klezmer combo. 19 points with a knee jerk! Declaring round 1 over with Phawkinson and PSC tied for 1st place. Shoot me your address by email so I get your prizes in the mail.